Welcome to liveUP’s Try the Trend. Every other week, we’ll challenge you to step outside your closet comfort zone and test-drive a trend. At thredUP, we believe in interpreting the trends rather than following them blindly, so we’ll feature real women (mostly thredUP employees!) who have taken a trend and made it their own. This week, we’re talking (and loving) summer’s hottest trend: head-to-toe white. 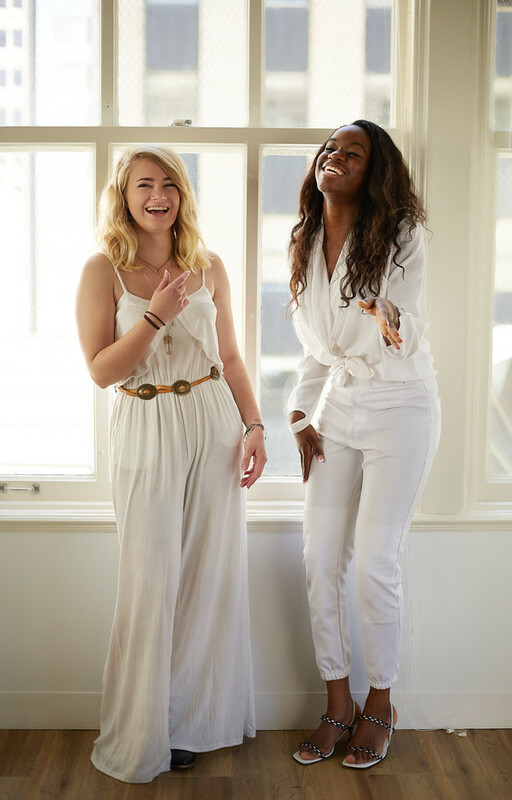 So, we asked two of our summer interns, Karis Dodd and Joy Ofodu, to show us how they’re rocking the trend this season. Get inspired by their looks and advice, then head over to our White Edit and dip your toes into the water. Stay tuned for our next edition of Try the Trend! Joy [right] is a USC student, entertainment industry junkie, photographer, serial thrifter and a thredUP Wolfpack intern. Describe your style: I try to strike a balance between femme and fatale. I lean toward white and black pieces, but occasionally I’ll add in a bright pink top or turquoise dress. I usually land somewhere between bold, edgy and athleisure. My long-time style icon is Rihanna; she cannot be contained. That’s what I aim for! And 80% of my wardrobe is secondhand. Good habits die hard. Describe today’s outfit: I’m big on all-black outfits, so this is new for me. But I love how bright it is! These baseball pants I thrifted are my absolute favorite—I like to dress them up and show them off. I’d definitely go to a party in these pants. What are some other ways you’ll interpret this trend over the summer? I think I’ll start throwing in some black accents for balance as I go along. Black and white are inseparable; you can’t fight their friendship. What do you think is most important to keep in mind when trying this trend? Remember that black hides really well underneath white! And avoid red sauce like the plague. Karis [left] is a business student at UC Berkeley. She’s orignally from Dallas, TX and is obsessed with baby goats, warm cookies, 90s grunge bands, and Twin Peaks (the show, not the restaurant). Describe your style: My style is a little bit bohemian and a little bit edgy, and I try to stick with a fairly neutral color palette. Describe today’s outfit: Today, I’m wearing a white flowy jumpsuit and dark brown leather boots. I belted the jumpsuit at the waist with a tan concho belt to break up the silhouette a bit, then I topped off the look with a few layered necklaces. I LOVE necklaces and very rarely leave home without them! I think this look is fun, retro and super comfortable. It would especially be nice to wear outside in the summer since the fabric is so light. I would definitely wear it to a music festival or a picnic. What are some other ways you’ll interpret this trend over the summer? This jumpsuit is a little outside my comfort zone because if I’m wearing one color it’s usually black, but I’m really liking this all white thing! I have a ton of white tops but no white bottoms, so I think I might try to find some to wear this summer. I’m envisioning white ripped up boyfriend jeans or a classic white midi skirt. What do you think is most important to keep in mind when trying this trend? I think it’s important to break up your silhouette when wearing one color. I’ll do that with a different colored belt around the waist or with two slightly different tones or textures on top and bottom. For this trend that could mean wearing crisp white pants with a cream colored shirt, or keeping the colors the same but playing with textures: a mesh white top and silky pants, for example. Shop our White Edit now and tell us how you wear the trend!